Impurities in gases, such as hydrocarbons, moisture and oxygen, can contaminate the gas line and instrument, cause column degradation and affect the accuracy of your analysis results, which may lead to instrument downtime. Even though high-purity gases are used, contaminants may result from pressure regulators or other parts of the gas line. Therefore, an additional gas filter is essential. Introducing the Shimadzu Super-Clean Gas Filter! The Shimadzu Super-Clean Gas Filter can remove the impurities (hydrocarbons, moisture and oxygen) and outlet 99.9999% pure gas. 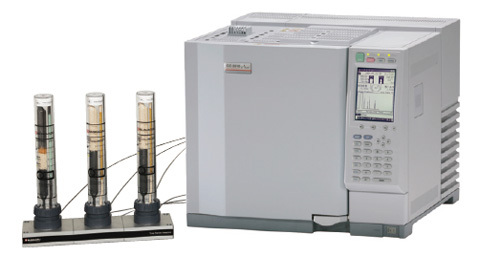 The use of high-purity and contaminant-free gases reduces column degradation, prevents ghost peaks and baseline fluctuations, eliminates excessive detector noise, and keeps your instrument in good working performance. The design of the Shimadzu Super-Clean Gas Filter makes it possible to replace filter cartridges quickly and easily without any tools. Spring-loaded check valves seal when a cartridge is removed and open only when a new cartridge has been locked in place, which prevents contamination of the system during the replacement process. The fittings connecting the filter and gas supply pipe are Shimadzu M type. Connecting directly to Shimadzu gas supply pipes ensures a leak-free and completely clean gas line. A plastic body helps with checking the indicators and replacing the filter cartridges. However, it also allows contaminants to diffuse into the instrument and cause helium to leak. To address this issue, the Shimadzu Super-Clean Gas Filter has been designed to pack the absorbents in glass inside the plastic body, thereby preventing diffusion. The Shimadzu Super-Clean Gas Filter is designed with an easy-to-read indicator. It changes color when the absorbent is saturated, indicating when filter cartridges should be replaced.